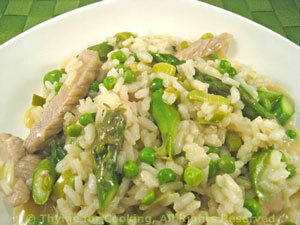 Risotto, Asparagus, Green Garlic, Peas, Veal, Thyme for Cooking spring dinner. Spring risotto, with fresh asparagus, peas, and a bit of green garlic. Enjoy the season! Prepare asparagus, cutting to 1 inch (2.5cm) lengths, reserving tips. Add green garlic, rice and sauté, stirring, for 2 - 3 minutes until rice has white center. Before the last 2 '1/3 cups', add the asparagus tips to the rice. Add the peas to the stock to heat. Pour off any remaining stock from the peas and add peas to risotto. Slice the veal scallops into bite-size strips. Add veal and sauté until cooked through.